The New Computer Museum maintains a complete collection of fully functional microcomputer hardware and software. In other words, this is what we DO collect. The first goal of this activity is to simply help educate the public about the history and importance of the microcomputer revolution. The second and far more important goal is to make an extensive, nearly exhaustive collection of microcomputer hardware and software available to the general public for use in teaching high school and college students about computer history as well as for retrieving digital history for both individuals and organizations. 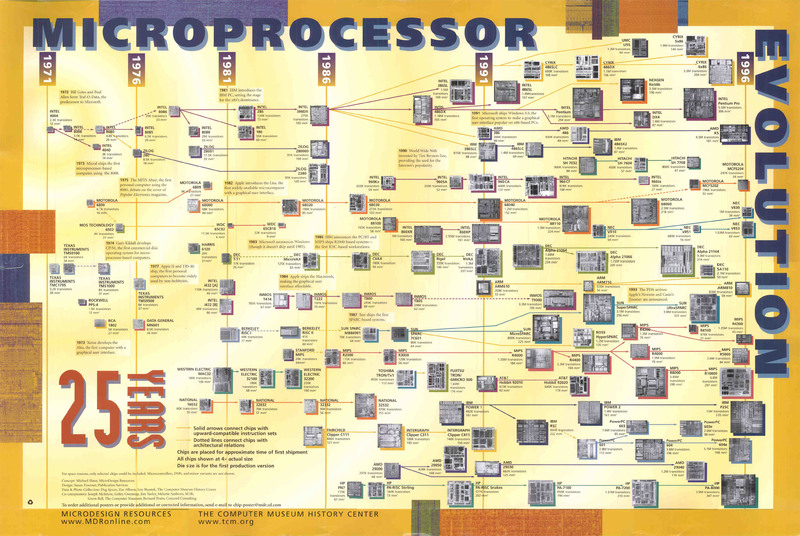 Intel introduced its first 4-bit microprocessor 4004 in 1971. Intel introduced its first 8-bit microprocessor 8008 in 1972. The 8008 was the precursor to the Intel 8080 that was introduced in 1974 and used in the MITS Altair 8800 computer that set off the personal computer revolution. The New Computer Museum has a copy of this famous January 1975 Popular Electronics with the Altair 8800 computer featured on the cover. It is on display in the virtual museum and will be displayed in the physical museum if / when there is one. Motorola released the competing 6800 in August 1974. Motorola release the similar MOS Technology 6502 in 1975. Various home computers and video game consoles that utilized the 6502 included the Apple IIe, BBC Micro, Atari 2600, Atari 800,Commodore VIC-20, Commodore 64, Nintendo Family Computer, Ohio Scientific Challenger 4P, and even the Tamagotchi digital pet. Swaminathan, N. (2011, July/August). Digging into Technology’s Past. Archaeology, 64 (4). The first programming language for the Altair was Microsoft’s founding product, Altair BASIC. The popularity of Altair BASIC, often not purchased legally, is what prompted Bill Gates to write this famous letter that is in the New Computer Museum’s collection. Here is a video that explains how it all happened straight from Bill Gates himself! Hiawatha Bray was kind enough to include an archival copy of a photograph from this event when he wrote about the New Computer Museum for the Boston Globe in 2013. The first Apple II computers were sold in 1977 with MOS Technology 6502 microprocessors. The New Computer Museum’s personal computer collection includes a number of early Apple II computers along with the original software. Here is a video of a child using one of the New Computer Museum’s Apple IIe’s with a rare TI-99 Sprite board running TI-99 Sprite Logo. Here is a wonderful Apple II emulator that has come in handy for the New Computer Museum’s virtual edition. VisiCalc, the first spreadsheet, was developed in a 6502 assembler running on the Multics time sharing system and was released for the Apple II in 1979. It turned out to be a “killer app” that helped to kick off the microcomputer revolution. The New Computer Museum will maintain running copies of Visicalc and it’s many children. 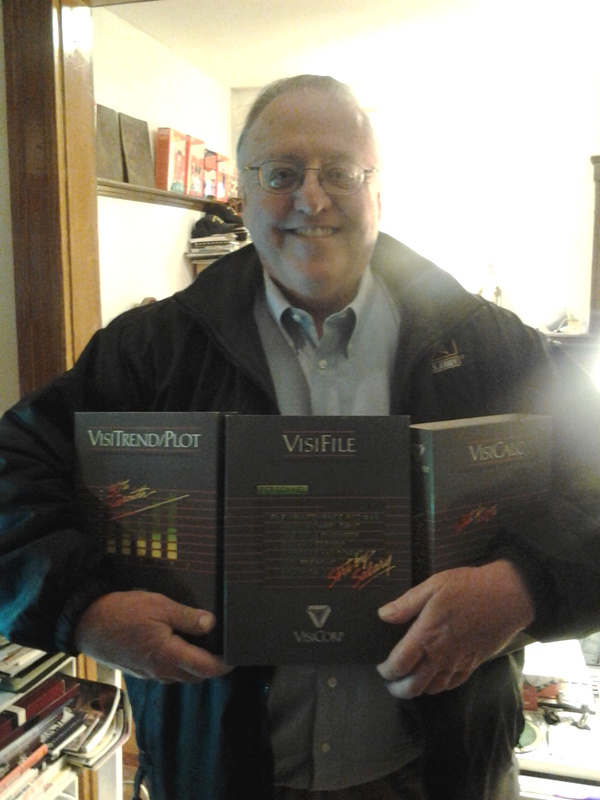 Bob Erickson, proudly donated a complete, pristine set of VisiCorp software! Robert Lawler has loaned a number of key Logo related systems to the New Computer Museum, and a functioning TI-99/4A with expansion module is among them. In this picture he is proudly showing off a functioning TI-99/4A running TI Logo. That same day he also dropped of a functioning Apple IIe along with the TI-99 Sprite boards that make it possible to run Sprite Logo and a Toshiba Home Computer HX 21 that runs a version of Japanese Logo. One of the primary goals of the New Computer Museum’s physical space would be to provide a public lab and library for use by non-profit organizations, educators, artists and others. It would be modeled on Harvard’s Libraries and Archives approach, but the facilities and services would be available to anyone with a non-commercial need. The New Computer Museum already has a solid start on this. The collection has over a hundred computers covering most major brands along with peripherals. To give a sense of the breadth, there are one or more of each of the following computers, and there are many other more recent Mac and PC computers and laptops not on this list. There is a software library with all of the necessary operating system, utility and productivity software needed to retrieve almost any data created since the Apple II. There is also an extensive collection of documentation, magazines and books about computer history. You can learn a lot more about the sources and evolution of the collection by checking out the far more extensive New Computer Museum History. This is a very important part of the New Computer Museum’s mission, so there is an entire page in this guide devoted to the Public Lab.